Just read this from the “Hotline” section of the Herald Times. QUESTION: Where in Bloomington can I get a french fry sandwich? 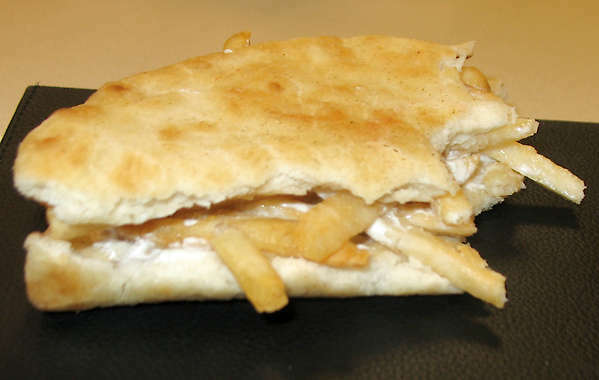 ANSWER: King Gyros, 2000 S. Walnut St., will make a delicious french fry sandwich on pita with lemon juice and tzatziki sauce (see photo) on request. In an emergency, a sandwich made from bread or pita and french-fried potatoes — called a “chip butty” in the U.K. — can be fashioned from just about any restaurant that sells sandwiches or burgers and fries; just order a meatless sandwich, a side of fries, and assemble it yourself. This sounds like it’s worth a try! Two of my favorite foods together: bread and french fries. Okay, Mike, if you say….. Ha! Well, I guess that I should not make fun of ya…I happen to like those two things much too much, also, but somehow as a sandwich? I know you don't care for it and I probably shouldn't care too much about it anyway, but when you were a little kid, there was that commercial..I believe it was a Wendy's and the little old lady asks..”Where's the beef?! !” LOL! HAHA, I don't care where the beef is so long as it isn't on my sandwich! I had the same reaction, but I'm wondering if the tzatziki sauce is the glue that holds the sandwich together. I may have to try it next time I'm in town! your favorite foods are bread and fries? If your favorite foods are bread and fries it is no wonder you feel compelled to pray the rosary in Latin while running: Reparation for all the bad stuff you are doing to your body dude!